Exposing students to a variety of new words and having them engage with those words is extremely important for vocabulary acquisition, but we know there are other skills students also need to develop in order to know the meaning of the words they are reading. One of those skills is the ability to breakdown a word into its simplest form and look at the word's root and affixes in order to understanding its meaning. 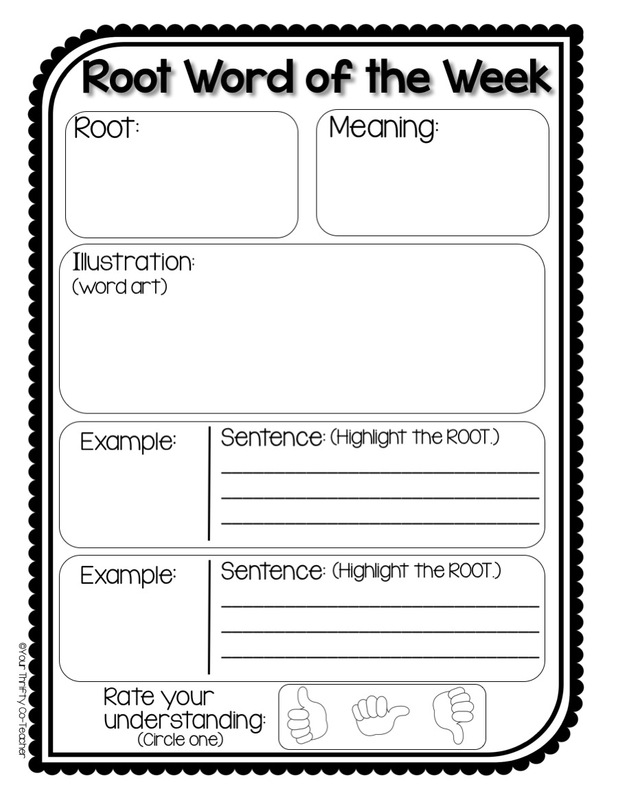 In order to be able to do that, students need to have an understanding of what a root word is as well as their meanings. In the research article THE LATIN–GREEK CONNECTION: Building Vocabulary Through Morphological Study, Tim Rasinski, a leading expert in fluency and vocabulary instruction, explains the value of exposing students at a young age to Latin and Greek root words. In his article, he outlines the reasons why incorporating Greek and Latin root word instruction is beneficial. Most academic words in English are derived from Latin and Greek. Most multisyllabic words in English contain a Latin or Greek root. A single Latin or Greek word can be found in over 20 English words. For Spanish speaking ELL students, teaching Latin roots helps them learn the English language by bridging it their native language. According to Robert J. Marzano and Julia A. Simms of Vocabulary for the Common Core, students should have multiple interactions with a word (in this case a root word) in order to acquire it. This includes, but is not limited to, being able to provide a description of the word, give an example, and construct a picture or symbol of it. 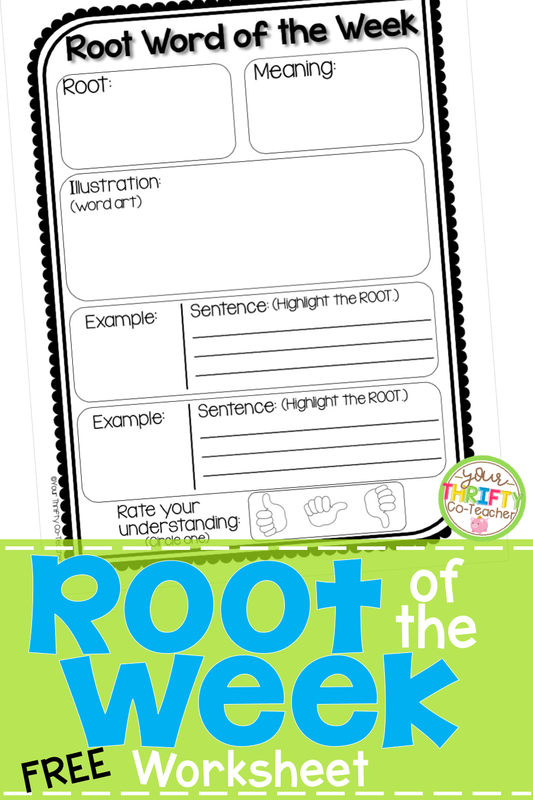 An effective way of getting students to interact with and learn the meaning of roots is to implement a Root of the Week routine. 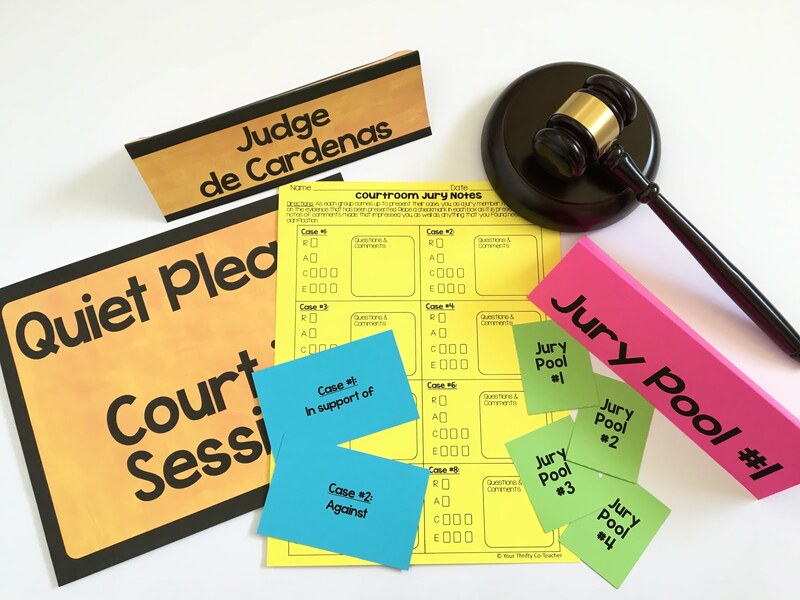 This allows students to apply the knowledge they gain to unknown words and arrive at its meaning. 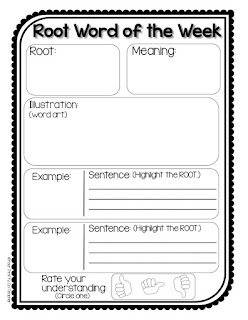 Monday: Have students write down the Root of the Week and its meaning. 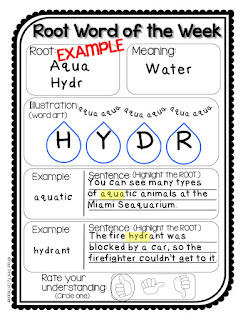 Tuesday: Students create an illustration (word art) with the root. If you see that students are having a difficult time coming up with an illustration on their own, you can direct them in a guided drawing using the board and having them copy it onto their worksheet. Wednesday: Students research or think up of two words that include the root word, and write it down on the worksheet under the "Example" subheadings. 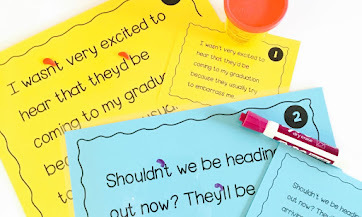 Thursday: Students write a sentence that include the word they came up with yesterday and write it in the space provided. Then, they highlight the root of the word. 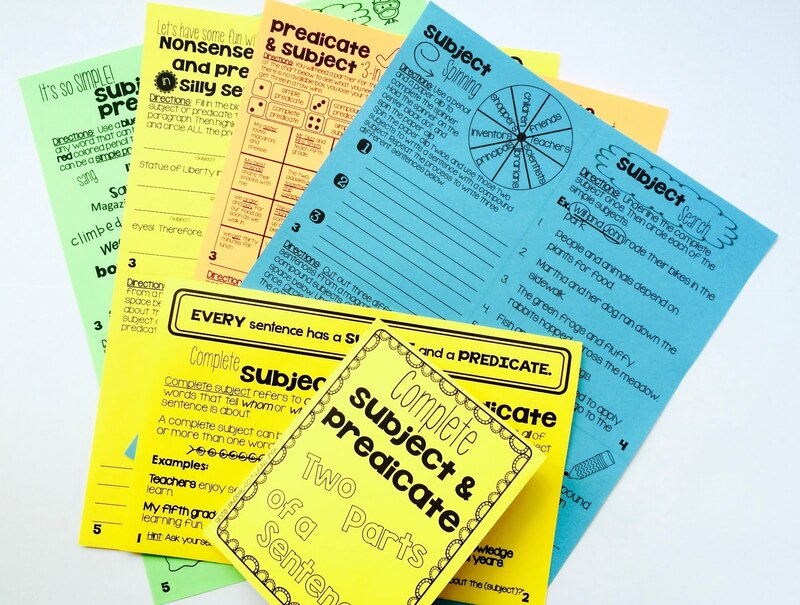 Friday: Students share their sentences with a partner and rate their understanding of the root. The following worksheet can be used as a weekly template for students. 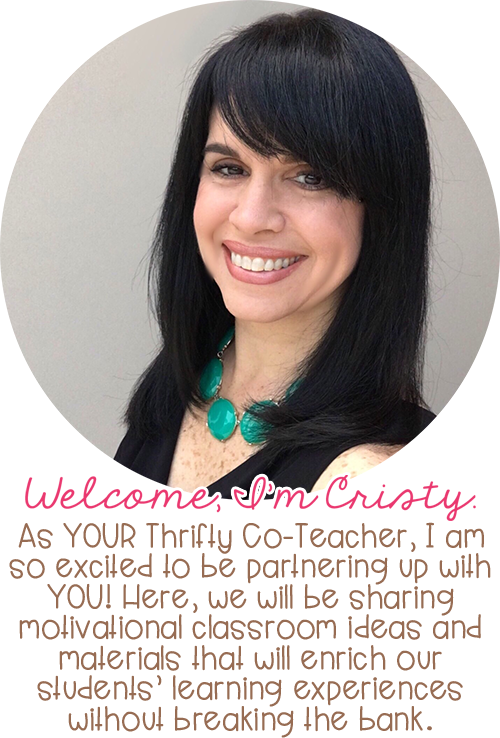 Just make a copy for each of the students, have them complete it weekly, and keep it in a small binder for future reference. This page can also be found as part of a Root of the Week resource you can find by click HERE. You can sign up below to receive this FREE download into your inbox. Send me my FREE Root of the Week Graphic Organizer! 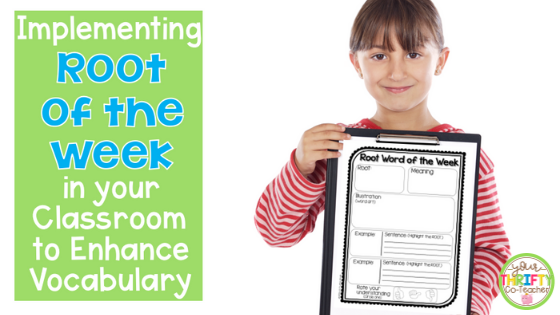 If you'd like to read how implementing a Word of the Week in your classroom can also assist your students with their vocabulary acquisition, click HERE to read about it.